FILE PHOTO: South Africa’s Hashim Amla walks off after losing his wicket. BLOEMFONTEIN, South Africa - Hashim Amla and Faf du Plessis completed their centuries as South Africa moved on to 530 for three at lunch on the second day of the second test on Saturday. 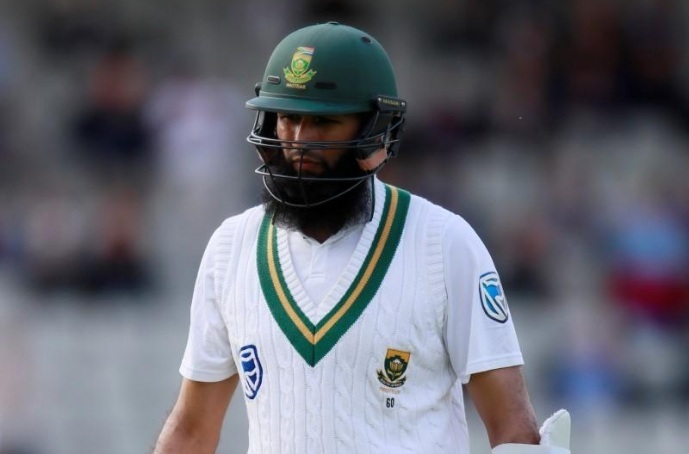 Amla, 89 not out overnight, quickly moved onto his 28th test century, the second highest number for a South African, and was 132 not out at the interval. Du Plessis went from 62 to 120 not out as South Africa kept up a quick run rate, adding 102 runs in a session restricted to 90 minutes after rain delayed the start of play. Amla and Du Plessis joined Dean Elgar, who made 113, and Aiden Markram, bowled for 143 in his second test, as centurions in the game. South Africa won the first match in the two-test series by 333 runs. South Africa - Hashim Amla and Faf du Plessis completed their centuries as South Africa moved on to 530 for three at lunch on the second day of the second test on Saturday.